After first appearing in publication in 1852, this painting was featured in several exhibitions and received ample praise in the art press. Some writers even spoke of it on par with Cologne's most famous work, Stefan Lochner's Virgin in the Rose Bower, often considered the acme of late Gothic painting in Germany. The back of this painting retains much of its original black coating, flicked with white in imitation of stone. 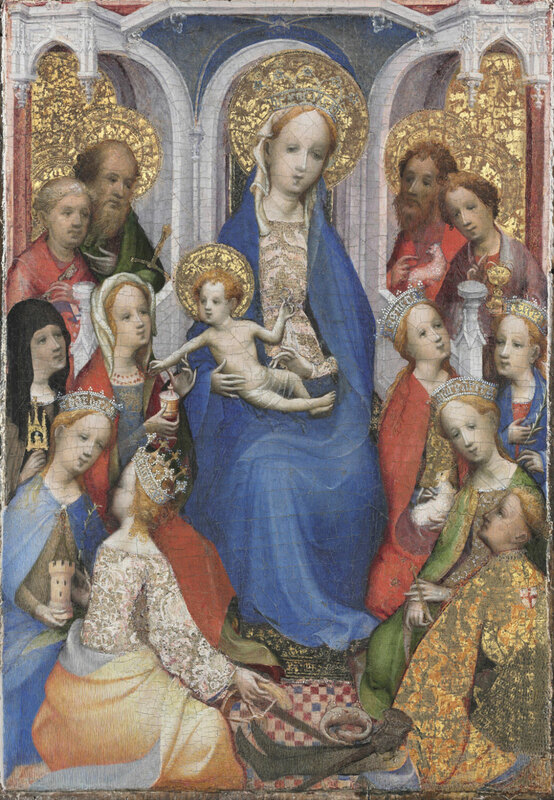 Around the enthroned Virgin and Child a group of saints are gathered like royal attendants. The crowns and rich costumes of the female martyr saints and of Saint George—the paragon of the Christian knight, who is seated rather rakishly on the floor, with legs outstretched—underscore the courtly nature of this small panel made by an anonymous master working in Cologne, a thriving artistic center on the Rhine known for the elegant Gothic style favored by its artists. After first appearing in publication in 1852, this painting was recognized as a masterpiece of this style. Carl Brandon Strehlke, from Philadelphia Museum of Art: Handbook. Philadelphia: Philadelphia Museum of Art, 2014, p. 89.